2015 is quite a year for science fiction fans. This December will see the release of the seventh chapter in the Star Wars series, The Force Awakens, one of the most eagerly anticipated films of all time – and potentially the most lucrative. 2015 also marks the 60th anniversary of Dune, Frank Herbert’s science fiction masterpiece. Set millennia into our own “future”, Dune tells the tale of a young nobleman who enlists the powers of a strange desert people to avenge the death of his father. Arguably, George Lucas’ Star Wars borrows more than just a desert setting from Herbert’s 1960s classic. One thing that the two sagas certainly have in common is an abundance of fantastic and exotic words. From Herbert, for example, we have “Paul Atreides”, “Vladimir Harkonnen”, “stillsuits” and “sandworms”. From Lucas and his colleagues, we have “Luke Skywalker”, “Darth Vader”, “lightsabers” and “ewoks”. But just how did Frank Herbert and George Lucas come up with these wonderful new words? Lucas and Herbert – just like George R. R Martin – might not be trained linguists. But, in naming the alien things and novel concepts that populate their fantasy worlds, they both demonstrate high levels of sophistication in lexicogenesis – the term linguist Gary Miller uses to describe the processes which give rise to new words. And, as it turns out, they rely on the very same processes of word creation that linguists have identified on our own planet – the very same mechanisms that all of us can use, and which keep English topped up with everyday neologisms like “manspreading”, “contactless” and “binge-watch”. So, in celebration of a bumper year for science fiction, here are the ten main ways that budding science fiction writers, like Frank Herbert and George Lucas, can create new words for new worlds. Of course, new fantasy worlds need to have some commonalities with our own universe or otherwise we’d struggle to connect with them on any sort of level. It’s no surprise that both Dune and Star Wars feature humans (or humanoids at least) – as well as planets, stars, deserts, food, drink, gravity, love, hate, and so on. It’s trivial to say that, for most of these, there’s no need for a new word. It suffices to use the relevant linguistic label (the common noun), like “planet” or “star”, that already exists in English – or whatever language the writer is working in. But where the word and concept doesn’t exist in English, there’s also the possibility of borrowing common nouns, and the relevant concepts they represent, from other languages too. Herbert does this masterfully in Dune, borrowing heavily from Arabic (“Butlerian jihad”, “erg”, “Mahdi”) and Persian, as well as Turkish, Latin and French. In Dune, the title for the ruler of the galaxy (the “Padishah” Emperor), for example, comes directly from Persian. In borrowing these words and concepts, Herbert gives us a flavour of “Galach”, the “official language of the Imperium” and the native tongue of Dune’s central characters. In the same way that the English of North America mixes British English together with words and concepts from Spanish, French, and various indigenous languages, Herbert’s fictional language is “hybrid Inglo-Slavic with strong traces of cultural-specialisation terms adopted during the long chain of human migration”. Lucas too, is not afraid of a bit of borrowing either. The word “stormtrooper” (the English translation of “Stosstrupp”), for example, comes from Nazi Germany. In any science fiction universe, people and places need naming too. Proper names can be taken from a variety of source languages, and not just English. Herbert, for example, borrows many first names and family names directly from English (“Jessica”, “Duncan”) as well as Russian (“Vladimir”), Finnish (“Harkonnen”), Chinese (“Yueh”), and ancient Greek (“Leto”). Lucas also derives characters’ names from a variety of sources, including a Moghul emperor (“Admiral Ackbar”) and a 1960s TV character (“Han Solo”). Despite the linguistic diversity, however, it’s perhaps not surprising that the central characters of both Dune and Star Wars still have first names (“Paul” and “Luke”) that are less than alien to English speakers. Proper names can also be borrowed to name other things too, such as places. Dune’s “Giedi Prime”, for example, is derived from the name of a star in the Capricornus Constellation. Luke Skywalker’s home planet “Tatooine” takes its name from a city in Tunisia. And, as is the case on our own planet, you can use place names as surnames (Dune’s “Duncan Idaho” or Star Wars’ “Wedge Antilles”), or surnames as first names (“Anakin”, for example, comes from the surname of a British film director). And, likewise, if you want to give familiar names and labels just a whiff of the exotic, you can use an unusual spelling but keep the sound or pronunciation the same. One of Herbert’s minor characters, for example, is called “Piter”. This is something that George R. R. Martin does to even greater effect in A Game of Thrones (think “Robb Stark”, “Jaime Lannister”, “Joffrey” and “Ser Jorah”). Related to the first two, you can also take existing linguistic labels, from English or otherwise, and apply them to new – seemingly unrelated – concepts or things. In Star Wars, the proper names of characters “Wedge” and “Wicket” are everyday common nouns (the latter being everyday, at least, if you are a fan of cricket). In Dune, Arrakis’ all important spice “melange” borrows its label from the French for “mixture”. The drug “verite”, for example, looks like the French word for “truth”. In fantasy fiction, it’s not always clear whether there is supposed to be a semantic link, metaphorical or otherwise, between the linguistic label from our own planet and the concept, person or thing it is used to represent – even if you can’t stop yourself as a reader from mentally trying to find one. For example, it’s not clear whether the Dune spice is supposed to be a mixture of various substances, or whether “verite” – a bit like ten pints of lager – is more likely to make you tell the truth. However, what is certain is that another very good way of naming new concepts and things is to simply take an existing word, and extend its meaning. Herbert, for example, uses this process of semantic extension to come up the word “shield” (some kind of electromagnetic defensive barrier) and “carryall” (a flying vehicle for transporting spice). Famously, Lucas extends the common meaning of “force” to describe the invisible “energy field created by all living things” that gives a Jedi their power. Related to this, another way to create new words is the process of conversion – that is, taking an existing word and changing its grammatical function. Verbing, the process of creating a verb from another part of speech, is a very common example of conversion in English (think “to email” and “to text”). Herbert does it, for example, with “weirding room”, creating a verb from the adjective “weird”. One simple mechanism for creating new words is to take old ones and make small changes to their pronunciation. For example, one of the major cities on Herbert’s Dune planet is “Carthag”, which can be arrived at by changing a phoneme (vowel or consonant) or two of “Carthage” (“Qartaj” in Arabic) – the ancient Tunisian city. Apparently, for Star Wars, Lucas derived the name “Chewbacca” from “sobaka” the Russian word for dog. Interestingly, these sorts of phonological changes often mirror the changes that happen to words on our planet, as languages evolve, or as they are borrowed from one language into another. In any language – certainly in any Earth language – words are built up from smaller chunks of meaning, called morphemes (themselves built up from phonemes). As a result, new words can be formed by chopping bits off existing words, or by adding adding other bits to them. In Dune, for example, Herbert creates a name for the galaxy’s currency “Solari” by taking the word “solar” and adding “-i”, which looks suspiciously like the Arabic suffix used to describe people from a particular region (think “Iraqi” or “Pakistani”). He also derives the name of the prevalent language, “Galach”, by chopping the end of the word “galaxy”, in a process which linguists call back-formation. Similarly in Star Wars, to create the gangster “Greedo”, Lucas takes an adjective befitting the character’s penchant for money and adds the suffix “-o”, an English device for creating faux Italian or Spanish names (like “el stinko”). Perhaps the most common – and most fundamental – way of creating new words is to simply combine old ones together. Both Herbert and Lucas rely heavily on compound nouns, which forge together two or more words – and the concepts which underpin them – to create entirely new ones. In Dune, for example, there are “stillsuits”, “groundcars”, “sandworms” and “battle language”. In Star Wars, famously, there are “star destroyers”, “lightsabers” and “the Death Star”. On Earth as on more distant planets, wherever compound nouns get too long, especially when describing machines or organisations, it’s not uncommon to substitute them for a suitable acronym. On Arrakis, for example, the “Field CP” is a “command post”. 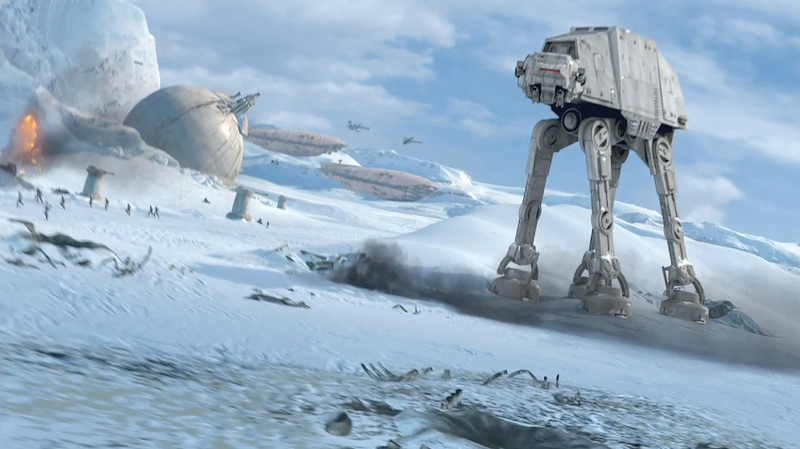 In Star Wars, “ATAT” is an “All Terrain Armoured Transport”. Of course, if you want to be really creative, you can use pretty much any combination of the processes above. Herbert, in particular, isn’t afraid to mix and match. He forms “lasgun” and “repkit”, for example, by contracting the compounds “laser gun” and “repair kit” to form what linguists call portmanteau words or blends. “CHOAM”, a powerful intra-galactic trading company, stands for “Combine Honnete Ober Advancer Mercantiles”, where “Honnete” and “Ober” are borrowed from French and Old German, respectively. Finally, if all else fails, you can simply create a new word from scratch – that is, from some arbitrary combination of vowels and consonants. When you do so, you need to make a decision whether the new word you create will fit into the sound system of English – that is, the set of rules which govern which phonemes, and which combination of phonemes, are allowed in English – or whether it will fit into some other, possibly alien, language. For example, while “Han” and “Hoth” are entirely plausible words in English, “pchagavas” and “hrobas” in Herbert’s invented “Chakobsa” language, are definitely not. Whether that’s what Lucas had in mind is highly debatable, and the man himself has been known to spread a few myths about how his characters’ names were created. This entry was posted in Fantasy, language, linguistics, Literature, Science Fiction and tagged Dune, Frank Herbert, Game of Thrones, George Lucas, language, linguistics, neologisms, science-fiction, Star Wars, words. Bookmark the permalink. ← Why Have Languages Lost Their Mojo?